RA Rodriguez. 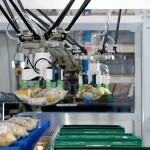 FDC’s automation, incorporating a Universal Robots UR3 table-top robot complete with Robotiq 2F85 gripper, has quadrupled output, reduced manning hours, increased consistency and reduced adhesive waste in glue dispensing operations for a respiratory filter. In a separate application, also automated by FDC, an IEF Werner three-axis domiLINE from RA Rodriguez has provided similar benefits on a 12-station spinning machine for the production of cylindrical filters. Haydock-based FDC is a specialist in all things filter-related, from initial concept consultancy and filter design through to automation and volume manufacturing services. 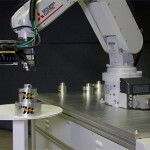 As part of its commitment to investing in the latest technologies, the need for a robot for one of the company’s glue dispensing lines arose after an existing client met with rapidly rising demand. 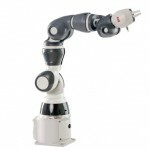 The UR3 is a recently introduced table-top robotic arm for light assembly tasks and automated workbench scenarios. The compact robot weighs only 11kg, but has a payload of 3kg, 360° rotation on all wrist joints and infinite rotation on the end joint. 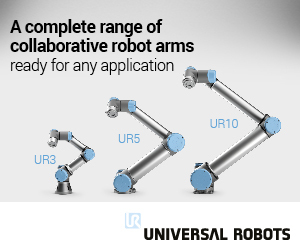 Importantly, the UR3 is built with the same proven collaborative technology as the larger UR5 and UR10 robot arms. 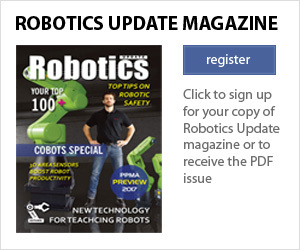 All three robots feature the identical safety system and ±0.1mm repeatability. The UR3 has a default force sensing of 150N but the configurable safety settings can be set to stop if it encounters a force as low as 50N, if required. The respiratory filter being manufactured at FDC contains pleated, glass media and is fabricated into a rectangle before being mated with a plastic frame featuring a glue channel on a complex curve. 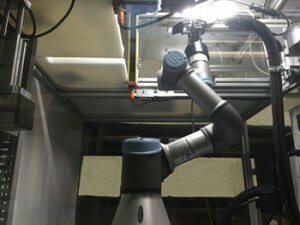 Complete with Robotiq 2F85 two-finger gripper, the UR3 manipulates the component and presents it to the automatic glue gun ready for adhesive application. The new system easily accommodated the rise in volume to 4000 per week, which is just as well because today FDC is producing 10,000 a week (220 per hour). 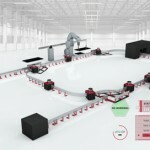 In fact, such is the success of the automated line that the investment in the UR3 robot and Robotiq gripper is on course for payback within six months, thanks largely to reduced labour input and less adhesive waste. 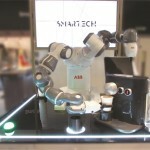 The second UR3 will feature the newly launched Robotiq 2F140 two-finger gripper, which has a wider stroke (140mm) and a 2.5kg payload to offer FDC the potential to test other filters on the same line. 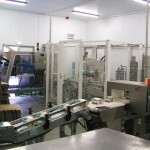 FDC has also used the services of Rodriguez for another, separate glue dispensing application in recent months. 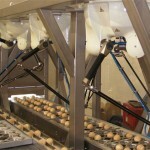 The company has invested in a three-axis (XY and R) domiLINE linear adjuster manufactured by IEF Werner. Able to offer easy adjustment on one of FDC’s 12-station spinning machines, the spindle-driven domiLINE slide system gives high levels of flexibility on the position of the glue nozzle (the glue head is fixed to the domiLINE system). The line produces several variants of cylindrical filter at rates of 400 per hour. Visit the RA Rodriguez website for more information.